Aisha Harris, New York Times: Every shot of “Searching” plays out on a screen — a computer, a phone, through the lens of a clandestinely placed camera. 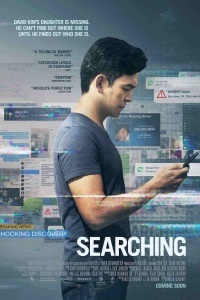 [T]he combination of clever concept reflecting the prevalence of screens in everyday life, and the pleasure of watching a typically underused Mr. Cho take on a meaty lead role make “Searching” a satisfying psychological thriller. David Sims, The Atlantic: Searching is a clever update on a housebound Hitchcock thriller like Rear Window, one that can make a series of Google searches play out like a high-wire action scene. Peter Travers, Rolling Stone: [D]irector Aneesh Chaganty, in an exceptional feature debut, does the impossible, building a high-voltage, white-knuckle thriller told almost exclusively through smartphones, laptop screens, browser windows and surveillance footage. Searching is a technical marvel with a beating heart at its core, which makes all the difference. Rotten Tomatoes interview with director Aneesh Chagnaty: When we were writing, we were quickly realizing that in order for this movie to have some weight, every single button, every single aspect of the UI of the technology, had to mean something more than just what it was. That’s how we approached the entire movie. I was worried this would be too film student-y with its storytelling device but that opening scene, which packs the same emotional punch as the opening of Pixar's Up, alleviated any doubts I had. 1) It would have been nice if the ending hadn’t depended on the one-in-a-million-chance of the memorial service using the same stock photo model as the one Vick’s son used in his catfishing scheme. 2) We could have done without the movie faking us out twice with the possibility that Margot had been raped. Overall, they did a stellar job of conveying emotion through online actions, like hiding an item from search results, or a typed-out rant in text, which was erased before sending, or deleting an item and emptying the delete bin. And they had a real sense of how a story like this would play out online. Of course an “Angry Dad Theater Attack” video (or whatever it was called) would be posted to YouTube. Of course random acquaintances of Margot’s would engage in performative grief on social media. It all felt so real. John Cho did a great job with a tricky role; he has to be really unlikeable in places, but also keep the audience invested in his story. Hope this leads to more work for him and for the filmmakers in the future. I saw this yesterday with my 12 year old, and we both enjoyed it. I was really glad to have a Hitchcockesque thriller to watch with her that was engaging and dealth with mature themes without being graphic. I agree that the stock photo reveal was a bit too convenient, but I saw Searching as a sort of tween-aimed “My First Suspense Movie” and worked fine for that purpose. Arrghghgh, enjoyed this movie, but [spoilers] very early on there's some document on a computer screen that calls Margot's high school "Home of the Catfish" (despite pictures that made it look like the mascot was a dolphin) and the whole time I was thinking "Someone isn't going to get catfished, are they?". I saw an early screening of this with the filmmaker in attendance, and I couldn't wait to leave. Maybe my view was ruined by the introduction he gave, where it was clear that he isn't a screenwriter, so I went into expecting to be disappointed. It also stretches credulity about a third of the way in, desperate to try and keep the "screens" device alive. I think I'd have been OK with the framing device being abandoned at that point rather than shoehorning in security cameras and other things. I will say that I'm happy to see John Cho in anything, and the actors playing his daughter and brother were really solid, too. I liked this overall, and especially thought Cho and Michelle La as Margot were excellent. * When Vick begins the volunteer search, and says "we've already searched these areas," which we later learn is just to draw attention away from the area where she knows Margot is. No one else on the force is going to say, "Um, wait, no we didn't...?" * When Vick is quick to declare Margot dead once the taped "confession" is released, despite not having a body. (Which, in retrospect, should have been a huge sign that Vick was involved, but I didn't pick that up then.) No one else on the force is going to say, "Slow down there, we still haven't found a body?" But the emotional core of the movie overcame any reservations I had about the gimmick of showing everything through screens. I never would have guessed that I'd tear up a little bit at "Use Image as Desktop Picture." First, I'm pleasantly surprised that even though this film had a super big SONY logo in the opening credits, that they didn't force all the characters in the film into some bizarre parallel universe where everyone uses SONY phones and laptops. Second, watching this kept reminding me of that 2014 Every Frame a Painting on Texting in Film and also certain indie games that use sounds and UIs of old PCs to draw you in to the story and to the protagonists POV. I'm thinking especially of another mystery genre media that featured a single actor/actress by themselves a lot: HER STORY. We're supposed to believe that despite being a whiz at everything else internet-related, the dad had never heard of Tumblr? This was a dumb movie, but entertaining. This sound mad, but: Did anyone else spot the alien invasion sub-plot? All the shots of news sites / social media / TV news broadcasts showed filler text and images to make them look real. Lots of headlines with short descriptions that look like links to full stories, some chyrons across the bottom of TV new screens, trending articles on facebook and twitter, etc. I reflexively read this stuff in films and games, especially in mystery/thrillers, partly because there could be a clue but mostly because it's fun to see what creative people do when they think people won't be paying (much) attention. Some were totally innocuous (sports results, weather), others plausibly contemporary (a few references to Trump), but a handful were... different. Very early into the film, a news website has a link to a story along the lines "NASA reports approaching EM phenomenon". Over the next day or so, there are another couple of headlines mentioning NASA and an approaching anomaly that's expected to cause disruption. Then we see headlines about green lightning associated with phenomenon, a spike in UFO sightings, a couple of alien abduction videos (I think the latter was on liveleak, when he was watching the "Crazy dad" video), and finally a headline that's something like "NASA to hold emergency press conference, with secretary of defense in attendance", with a photo of the Pentagon as its header image. Around the time Margot is recovered there's a headline about a "groundbreaking" announcement to come out of the White House, in close proximity to a NASA article. Someone had a lot of fun writing these background headlines and peppering them through the film. I doubt there were more than 15 articles about this spread throughout the whole film, but they told a coherent, slowly mounting story. I can't decide how I feel about it. On the one hand it's a great easter egg, and a funny but gentle way to wind up people like me who try to be a bit too clever instead of just paying attention to what the storytellers want us to. On the other hand looking for clues in a mystery seems pretty reasonable, and I spent a good chunk of the film worried that it was suddenly going to swerve into being an alien abduction story. I saw this too, and had the same reaction. Especially around "fish-n-chips". There are a lot of fun details in the background of this film, but I found it too easy to get lost in them at the cost of just enjoying the story. I also didn't love the solution and resolution to the mystery plot. Of course the killer was a quiet, slightly awkward-looking teenage boy we'd seen right at the start and had popped up in the background a couple of times to remind us that he exists. And of course the police department were willing to very publicly arrest their highly decorated star detective, purely because she'd volunteered to take the case and knew the guy who confessed. Overall though, I really enjoyed the film. I thought Margot's dad in particular was played brilliantly, and that the on-screen activity -- hesitations of mouse movement, text written then deleted, choices of desktop photos -- worked very well to tell the story of what was going on in the characters' heads, beyond their deliberate actions. I was glad they pulled a happy ending out at the end, but it was tricky and I don't think it would have worked without Messing selling the reveal in the interrogation room. Because surely you have to show that scene, right? You have to see Cho saying, Two days! And surely Cho is in a position to demand that big moment, right? But they gambled on recounting one of the biggest dramatic moments in dialogue and Messing's delivery was perfect in dramatic timing without sounding like she was talking to the audience instead of the interrogator. And it's so good because you can see that in the car the detective was telling the story of her son and what she did to try to help him, but the dad was hearing the story of his daughter and was right there with her to immediately realize how long she would have been lying there before the rain came. And yes, in hindsight, the stock photo showing up when it did was an almost ridiculous bit of coincidence, but in the moment it landed pretty well for me. By first thought, though, was wondering if this "Memorial Service Site" was a scam that some stalker was using to get all the family photos of the girl he kidnapped. But, like a lot of the misdirections in this movie (weed, a Bieber concert) the truth was both less lurid and more plausible. That woman's not evil, she's just a stock photo. I love twists that make a story more plausible than you expected rather than less. When Vick begins the volunteer search, and says "we've already searched these areas," which we later learn is just to draw attention away from the area where she knows Margot is. No one else on the force is going to say, "Um, wait, no we didn't...?" And of course the police department were willing to very publicly arrest their highly decorated star detective, purely because she'd volunteered to take the case and knew the guy who confessed. Sadly, I find the first of these way more believable than the second.